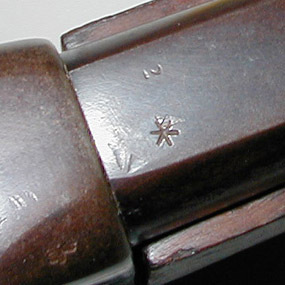 A star, or asterisk on the knoxform or barrel of a Martini-Henry indicates that rusting, or "honeycombing" was found. This mark was probably applied by armorers only, as a weapon would not have left the factory with such corrosion present. If the mark appeared on the knoxform as shown in this image, the honeycombing was in the weapon's chamber. If stamped on the barrel, the corrosion was in the rifled portion of the barrel. The number of stars indicated the severity of the damage. One star indicated "Slightly Honeycombed", two was "Honeycombed" and three was "Badly Honeycombed". The "Condemnation" marking - This marking was applied when a weapon was considered unfit for frontline use, or was obsolete. Though the name implies that the weapon is unsafe, or unusable, this is not necessarily the case. Such weapons were often used by colonials, cadets and militia groups after their release from military service. 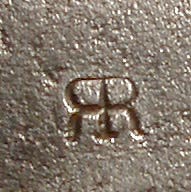 This mark, essentially two "Rs" back to back, was typically applied to the flat of the knoxform (as in this example) but has been noted in other places as well. This particular example, from a Martini-Henry Mark II Artillery Carbine also had condemnation markings stamped into the forend wood, near the pin. "Strengthened Extractor" - This marking indicated that the weapon has been upgraded with the strengthened Mark III extractor. This marking is thought to have been applied by armorers at the unit level, after he installed the new extractor. In 1886, the new strengthened Mark III extractor was integrated into the Martini-Henry's design, so weapons dated 1887 or newer often do not have this marking. It was sometimes applied to these weapons, just so unit armorers could tell at a glance which weapons were equipped with the Mark III extractor. This mark is always found on top of the action body, just in front of the breech area. There were minor variations in the marking, some have a period after each letter, some have a single period between the two letters, and one has no periods, but rather, a dash between the "S" and "X". "Not For Ball" - This marking was applied to weapons sent to cadet forces to indicate that only blank cartridges were to be fired from them. This marking doesn't necessarily mean the weapon had a problem firing real cartridges, but rather, it probably served more as a warning to cadets to not chamber live ammunition. 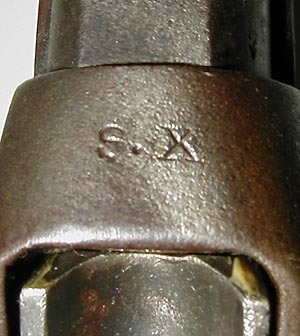 "Morris Tube" - This mark is sometimes found on weapons which were specifically set aside for use with the Morris Tube. The Morris Tube was a sub-caliber insert for Martini-Henry Rifles and Carbines which allowed for target practice using cheap ammunition. This marking will only be found on second class arms. "Drill Purposes" - This mark is typically seen on cadet weapons used for drill practice, or parades and such. Such weapons were almost always inactivated by cutting slots into the barrel or via other hideous means. This marking is also sometimes seen stamped into the forend wood, just in front of the action body. "N.S. NEP" - Native Service, Nepal. This mark is often seen on Martini-Henry Mark IV Infantry Rifles. Many Mark IV's served in India and Nepal. This marking is found on many large frame Martinis that have been converted to .22 caliber. 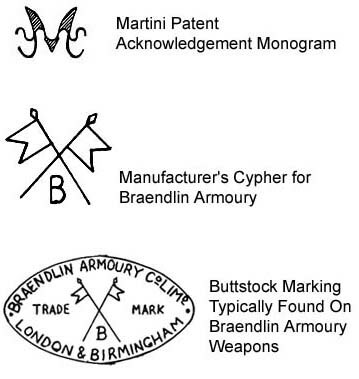 Shortly after the Martini's demise as a British Service Rifle, many were sold off to civilian rifle clubs and the British NRA (it is my understanding that the British Government also donated many surplus Martini-Henrys to these organizations). These surplus Martinis were then converted by various firms (W.W. Greener and C.G. Bonehill being the most common) to .22 caliber for use in marksmanship training at rifle clubs. The British Government encouraged civilian marksmanship training back then (unlike nowadays, where they're actively hostile towards private gun ownership), as it made basic military training easier, since the recruit already knew how to shoot. This proved very valuable during the First World War, when England's troublesome neighbor in Europe (Germany) got out of line. Precious days were shaved off the time it took to train recruits as a result of civilian marksmanship training. Such rifles are certainly not uncommon (I own three) but I have no figures as to how many were converted. Sometimes the marking for the "Society of Miniature Rifle Clubs" is seen in the abbreviated form, "SMRC". Here's the "W.W. Greener" version of this marking. Note that this one was converted for the British N.R.A. 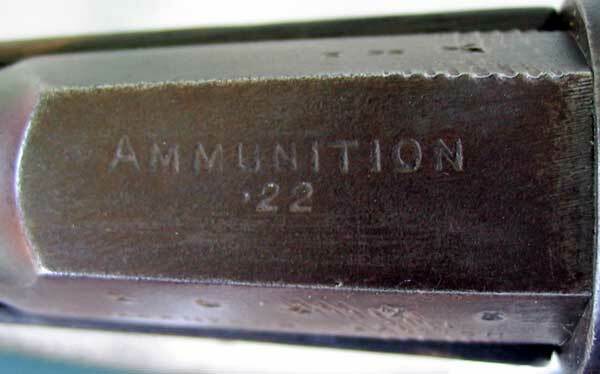 Upon conversion to .22 caliber, the barrels were often stamped with such markings to indicate the new caliber. It is also common to see a "Guaranteed British" marking on these as well. Drawings on this page are from "A Treatise on the British Military Martini, Volume 3". Many thanks to Ian Skennerton for permission to reproduce these drawings here.